The term wasp is typically defined as any insect of the order Hymenoptera and suborder Apocrita that is neither a bee nor an ant. The yellowjacket or "common wasp" is probably the most well known. Wasps are parasites in that they feed their larvae other insects -- often paralyzed by their venom. Like hornets, yellowjackets invade honey bee hives and steal honey or bee larvae to feed to their own larvae. Most wasps are not involved in pollination of plant species, compared to honeybees, which are involved in pollination of plants. Sphecius speciosus, often simply referred to as a cicada killer, cicada killer wasp, or the cicada hawk, is a large digger wasp species. They are often found near sandy baseball diamonds and in park where sand is available. They often fly low to the ground. 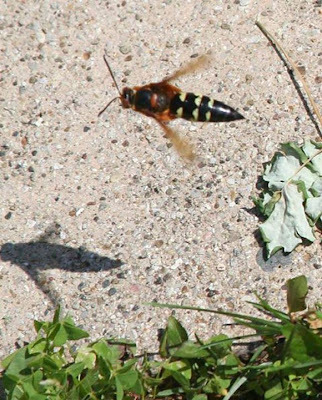 Cicada killers are large, solitary wasps in the family Crabronidae. The name may be applied to any species of crabronid which preys on cicadas, though in North America it is typically applied to a single species, Sphecius speciosus. However, since there are multiple species of related wasps, it is more appropriate to call it the eastern cicada killer. This species occurs in the eastern and midwest U.S. and southwards into Mexico and Central America. Eastern Cicada Killers hunt cicadas and provision their nests with them. Eastern Cicada Killers are often seen carrying Cicadas toward their nests. In North America Eastern Cicada Killers are sometimes called sand hornets, but they are not hornets, which belong to the family Vespidae. Cicada killers exert a measure of natural control on cicada populations and thus may directly benefit the deciduous trees upon which their cicada prey feed. Eastern cicada killers are solitary wasps, which have very different behavior compared to the social wasps such as hornets, yellowjackets, and paper wasps. Cicada killer females use their sting to paralyze their prey (cicadas) rather than to defend their nests. Eastern Cicada Killers do not attempt to sting unless handled roughly. Social wasps and bees will defend their nest with swarming and stinging with various tolerance distances to the nest. Cicada Killers do not Adults feed on flower nectar or other plant sap exudates. Adults emerge in summer, typically beginning around late June or early July and die off in September or October. They are present in a given area for 60 to 75 days, usually until mid-September. The large females are commonly seen skimming around lawns seeking good sites to dig burrows and searching for cicadas in trees and taller shrubs. The males are more often seen in groups, vigorously challenging one another for position on the breeding aggregation from which they emerged, and generally investigate anything that moves or flies near them. It is not unusual to see two or three male wasps locked together in apparent midair combat, the aggregate adopting an erratic flight path until one of the wasps breaks away. The male wasp's aggressive behavior is similar to that of another robust insect of the area, the male carpenter bee. In both cases, while the males' vigorous territorial defense can be frightening and intimidating to human passersby, the males pose no danger whatsoever. Male cicada killers will only grapple with other insects, and cannot sting.